Print Origami Paper → Robin Joy Riggsbee's Origami Paper #3-6"
What do artist's do when they can't find the perfect origami paper? They design their own! 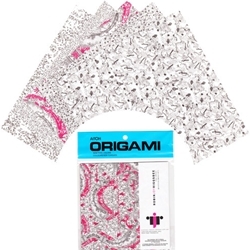 These origami packs are reproductions of Robin Joy Riggsbee's original design origami paper. Spice up your origami with this Robin Joy Riggsbee's Origami Paper Pack #3! This pack contains 20- 6”square sheets of elegant patterned origami paper. Each of the 5 pencil-drawn patterns incorporates black and white designs, one of which even adds in a splash red! Add some creativity to your origami with this fun Robin Joy Riggsbee origami pack!